Adorn Cosmetics Oil Free Liquid Mineral Foundation is a light-weight, mineral foundation that gives a beautiful, flawless and natural, long lasting finish that looks like your very own skin. The Adorn Cosmetics Oil Free Liquid Mineral Foundation is a light-weight, mineral foundation that gives a beautiful, flawless and natural, long lasting finish that looks like your very own skin. Combination or oily skin types will adore this liquid mineral foundation, as it’s non greasy and won’t clog your pores and is perfect for humid/hot climates. Recommended to apply with the Cruelty Free Kabuki Foundation Brush. 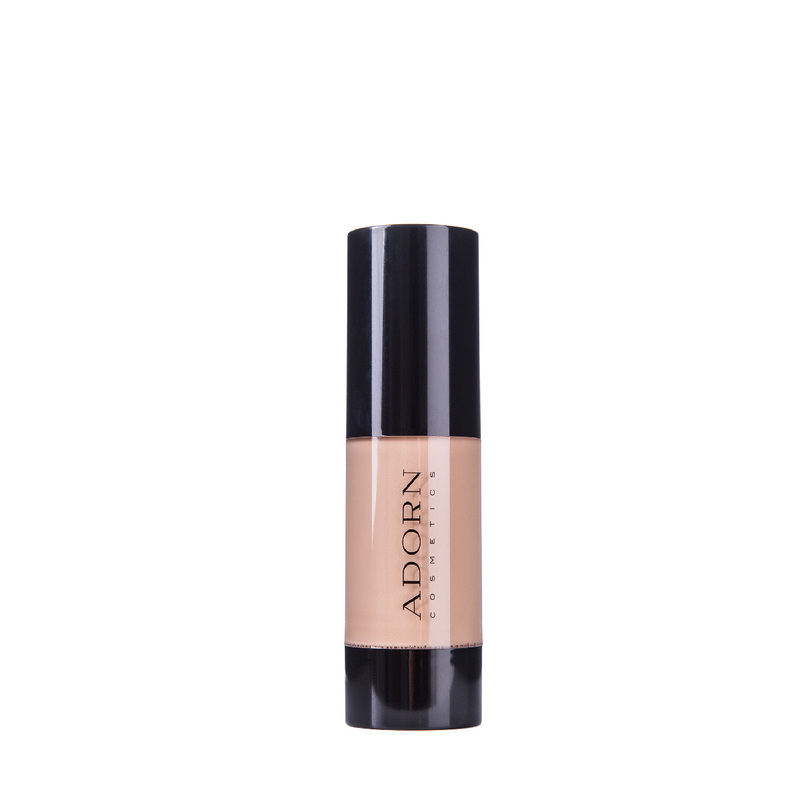 Adorn Cosmetics Oil Free Liquid Mineral Foundation comes in an airless dispenser and may require some pumping for first time use to disperse any possible air pockets. Ensure your Adorn Primer or Facial Oil has absorbed first. Dot 1-2 pumps of foundation evenly over the face. This formulation dries quite quickly and therefore is best applied with our Kabuki Brush. Gently buff onto the skin for an air bushed and flawless finish. TIP: Find your correct foundation shade by applying a small amount along your jaw line in the cooler months and décolletage in the warmer months; if it blends and there are no obvious lines, then it’s a perfect match. Alternatively you can purchase a sample. Store below 30 degrees and keep out of direct sunlight. Packaged in luxury ‘airless’ pumps for optimal formula protection and increased shelf life, Adorn Cosmetics Oil Free Liquid Mineral Foundation is not compromised by the damaging affects of air through oxidization. With each pump, the product is pushed upward, creating a vacuum as the product is dispensed. This vacuum eliminates waste in two ways: The airless environment preserves the product’s efficacy and freshness longer than traditional packaging, and it also allows for every last bit of product to be easily extracted by our customers.